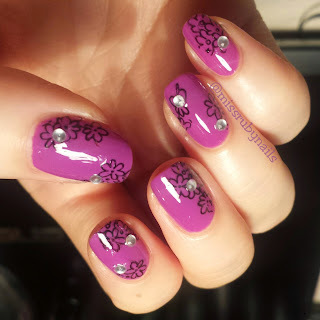 Stamping is considered a lazy manicure when I don't want to think what combination of colors or nailart I want to make. Haha. 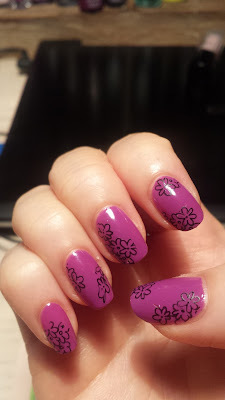 Here's a simple one color floral stamping nail set. 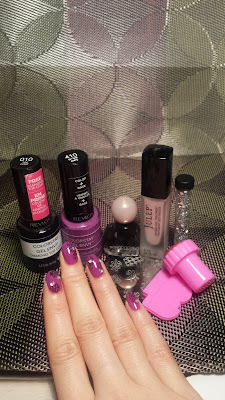 I used a fuchsia purple polish as a base. 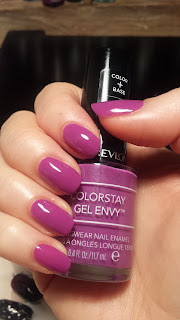 This was my first time trying a polish from this Revlon Gel Envy line. It applies quite nicely and it was easy to control. I used a total of 2 layers to achieve this look. I also used the gel top coat from this line but I didn't think it was anything special! I then used a black polish for the floral print and positioned the stamp on one side or at opposite corners of the nails! I then finished it off with some silver jewel beads on random spots. Click HERE for stamping tips and tricks!